A group of Israeli settlers have been captured, on video, stealing olives from Palestinian farms near the occupied West Bank city of Nablus. According to Israeli human rights NGO Yesh Din, incidents like these are repeated every year. 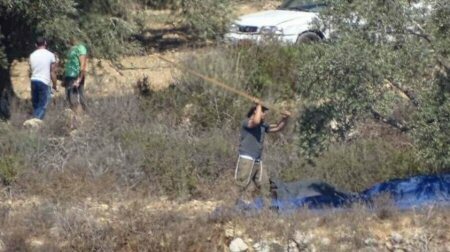 Last year, thousands of kilograms of olive crops were stolen by settlers in the Nablus area, the group said. Speaking to Middle East Monitor, a Palestinian farmer, who asked not to be named, said occupation forces gave him only three to four days to harvest and care for his crop. “We go, as a family, as early as 6:00 in the morning and finish by Asr prayer [late afternoon]. Last year they gave us three days, one time the soldiers were late in the morning, one time they made us leave by noon,” the farmer said.